Shadows are proportional to the height of their objects: if one doubles (or triples, etc.) so does the other. Below are a mailbox and a tree. 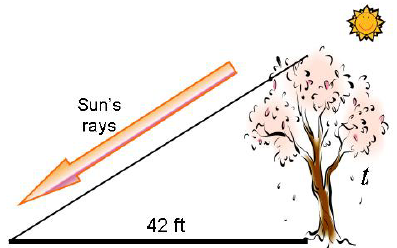 How tall is the tree? In September, 2016, the U.S. national debt is about $19,528,320,500,000. The U.S. population at that time is about 324,557,050 people. How much was each person's share of the national debt? The number about nineteen trillion is too long to fit into most calculators! The solution (for most calculators) is to round both numbers to the nearest ten-thousand. Treat both numbers as "such-and-such ten-thousands" and they will both fit. This is similar to doing arithmetic with the two values "15 million" and "5 million". The word "million" can be treated as a label that does not actually go into the calculator. Martha drinks 5 cups of coffee every 4 days. How many cups of coffee is this per year? How much are fractions like division? We know that we can change fractions to decimals by doing division. In this sense fractions are like division problems waiting to happen. Fractions typically belong in their most reduced form. In this sense they are not like division. When we divide one number by another we do not reduce the numbers first. We talk about "equivalent fractions" but never "equivalent division problems". Sometimes it helps to deal with a pair of numbers as if they were the numerator and denominator in a fraction. This can be true even when the pair of numbers comes from a real situation that gives each number an individual meaning (neither is inherently "numerator" or "denominator"). That is the job for a ratio. A ratio is a comparison of two numbers, usually written as a fraction. If I interviewed 10 dentists and 8 of them approved of a certain breath mint, I could write the ratio 8/10. Often it does not make sense to reduce a ratio. If I reduced the above ratio I would get 4/5. As a fraction (or as a decimal) this has the same value. But it no longer represents something from the real world. I did not interview 5 dentists, of whom 4 approved! One big difference between normal fractions and ratios is that normal fractions always have the numerator count special parts, and the denominator count total parts. 3 special parts/8 total parts. The pie is cut into 8 pieces and I get 3 of them. In contrast, a ratio might be a comparison of two partial amounts. The whole can be missing! 4 left-handed people/16 right-handed people. We could look at this ratio and find the whole (20 total people). But the rate does not explicitly tell us the whole. We can even write a ratio upside down without losing any meaning or becoming confusing. 16 right-handed people/4 left-handed people. Normal fractions, in which the denominator is always the total number of parts, cannot be flipped like that without their meaning changing. Not all ratios are written as fractions. The ratio 8/10 can also be written as 8 to 10 or as 8 : 10. But in real life, almost no one but the writers of SAT tests and gamblers write ratios that way. Chapter 5 Test, Problem 1: Write the ratio "85 to 97" in fraction notation. Do not simplify. Chapter 5 Test, Problem 2: Write the ratio "0.34 to 124" in fraction notation. Do not simplify. Did you notice that some ratios include words to label the numbers? A rate is a kind of ratio in which the two numbers have labels. If I interviewed 10 dentists and 8 of them approved of a certain breath mint, I could write the rate 8 approvals/10 dentists. Once again, we could change a rate into an equivalent fraction but typically do not do so to preserve the record of a real life situation. A unit rate is a rate whose second value is 1. Any rate can be changed into a unit rate by treating the rate as a division problem. Doing "top ÷ bottom" simplifies the rate into a unit rate. More formally, we are reducing the original rate by dividing the top number and the bottom number by the bottom number. This changes the bottom to 1, which we then ignore. So overall we only see "top ÷ bottom". My favorite candy costs $14 for a two-pound box. What is the price per pound? Chapter 5 Test, Problem 6: A twelve pound shankless ham contains sixteen servings. What is the rate in servings per pound? Chapter 5 Test, Problem 7: A car will travel 464 miles on 14.5 gallons of gasoline in highway driving. What is the rate in miles per gallon? Chapter 5 Test, Problem 8: A sixteen ounce bag of salad greens costs $2.39. Find the unit price in cents per ounce. Unit rates make comparisons easy. We might prefer either the biggest or the smallest unit rate. I am shopping for fancy hand lotion. Which is a better deal, 10 ounces for $5 or 24 ounces for $8? If we find ounces per dollar we want the most ounces per dollar. If we find dollars per ounce we want the least cost per ounce. A proportion is an equation of the format "ratio equals ratio" (or "rate equals rate"). Note that proptions are much easier to read if the ratios are not written as "slanted fractions" the way HTML forces web page typing to do. During lecture we will rewrite these problems so they look like "numerator on top of denominator fractions" that are easier to work with. It a little bit we will talk more about proportions. For now just know the definition, and be ready to learn how it is different from the term "proportional".